Seraphina is an impossibility. She was born to a human father and a dragon mother. Although dragons can take human form, it is forbidden for them to cohabit with humans. Seraphina’s mixed heritage is both a blessing and a curse. She is gifted with an extraordinary, inhuman talent for music, but also a swath of scales on her forearm and midsection that betray her mixed parentage and put her in mortal danger. Unable to hide her talent, Seraphina is hired by the royal palace of Goredd. The unexpected murder of Prince Rufus lands Seraphina in the middle of the court scandal. Seraphina aligns herself with the handsome Prince Lucian and beautiful Princess Glisselda to solve the mystery of the prince’s death. What she uncovers is an intricate plot that could upset the delicate balance of the peace treaty between humans and dragons. As the pieces of the mystery begin to fall into place, it becomes increasingly difficult for Seraphina to hide her identity and she must make some very difficult choices that could jeopardize her life and future. Seraphina is an exceptionally written novel that takes modern themes and places them in a magical setting. Seraphina struggles with her mixed heritage. She must hide her dragon scales because they are considered an abomination by both humans and dragon kind. I was greatly reminded of the slave era and the legacy that this time period has left on race relations in American culture. Although it is now more common for society to embrace mixed race individuals, it is still difficult for some mixed race teens to find where they fit into the intricate framework of their community. Seraphina is ashamed of her differences because of the pressures of society, and although the description of her shiny scales sounds quite lovely, she sees them the clouded lens of racial prejudice. Many teens struggle with accepting their appearance, and Seraphina’s struggles ring true with notion of discovering self-worth. In the end, she must come to terms with the fact that she is not an abomination and is very much worthy of love. Reader’s Annotation: Being a teen is hard, but being a teen covered in dragon scales is even harder. In a world where dragons and humans are not supposed to intermingle, Seraphina struggles to come to terms with her mixed heritage. 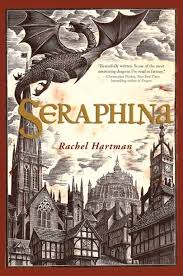 Seraphina was Rachel’s debut YA fantasy novel published in 2012. Since its publication, she has released a sequel titled, Shadow Scale. Rachel has received several awards for her novels, and both have appeared on New York Times Bestsellers lists. Discuss the transformative power of music, and relate it back to Seraphina’s flute. Justification of Selection: This book examines the intricacies of race relations and multicultural heritage. Seraphina is of mixed parentage, like many young readers, and her struggles to find her place in the world are very real.